Last week, the Trump administration asked the courts to strike down the Affordable Care Act in its entirety. Linda McCray worked for 35 days without pay during the Trump Shutdown, keeping passengers safe and planes on time at the Washington Air Traffic Control Center. Congresswoman Wexton invited Ms. McCray to be her guest at the State of the Union, as the prospect of a second shutdown looms. Rep. Wexton participated in the Northern Shenandoah Valley Substance Abuse Coalition's monthly meeting in Winchester on Thursday, taking notes and questions from the array of treatment providers, school administrators, law enforcement, and recovering addicts who were in attendance. Rep. Wexton co-sponsored a bill to raise pay for civilian federal workers, following President Trump's announcement that federal employees would see a pay freeze in 2019. The bill, led by fellow Virginia Congressman Gerry Connolly (D-VA), would increase pay for 2019 by 2.6%, equal to wage increases announced by the Trump administration for military servicemembers. Rep. Wexton joined Rep. Joe Kennedy (D-MA), chair of the Transgender Equality Task Force, for a roundtable with parents of transgender children. The Members listened to stories about the importance of fostering welcoming spaces in both schools and the community as well as the need to pass the Equality Act in the 116th Congress to codify legal protections for LGBTQ Americans. Congresswoman Jennifer Wexton (D-VA) co-sponsored a bill that guarantees back pay for federal workers who are furloughed because of the shutdown. 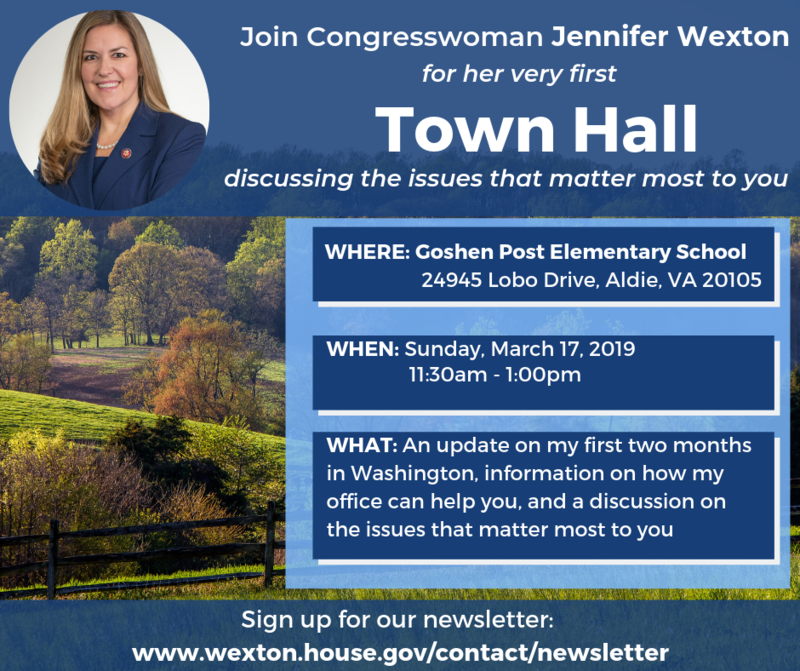 Virginia's 10th district is home to more than 35,000 federal employees, many of whom have reached out to Rep. Wexton to share their stories of how the shutdown is creating financial burdens on them and their families.